Brady Byrum, come out, come out, or hide out still! – Kent Hovind v. Robert Baty – The Great Debates! 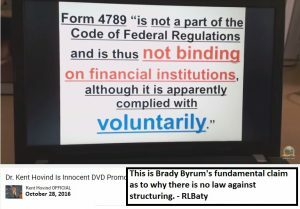 Home→Brady Byrum, come out, come out, or hide out still! Kent Hovind was innocent of the charges for which he was convicted in 2006. Brady, you and Kent have been hiding out for years while promoting your false legal narrative regarding Kent’s 2006 case. 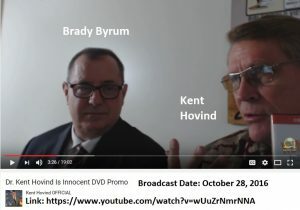 Now that you have released “Kent Hovind Innocence DVD” which reportedly includes a letter writing scheme of some kind that will allegedly result in, if successful, the reversal of Kent’s convictions and the awarding of up to $30,000,000.00 to him, it’s time for you or Kent or some other surrogate to come out and face the legitimate opposition and pursue a discussion in the public square as to the merits of your scheme and legal claims. Brady, you seem to have made up your mind that Kent was “truly innocent”. I have made up my mind that he was “truly guilty”. Brady, you have yet to demonstrate you are willing to examine the truth. I am ready to engage in that examination of the truth. Brady, you don’t need to hide your scheme and demonstrate, implicitly, that it’s not about the truth but the money. I don’t need to bother acquiring your DVD package. You are welcome to send me a complimentary package for reference if you wish to make reference to anything therein as you make your effort to support your proposition as stated above. That is, if you are willing to come out and examine the truth claims and test your position. Brady, you and Kent and your followers are welcome to go on believing whatever you want regarding Kent’s long criminal history. “We” are watching as you continue to promote what appears to clearly be a false legal narrative, and that for the money. I think you know the truth, and that you are wrong. Kent has already admitted that the reason he doesn’t face me is because he knows I am right and he, and you, are wrong. I know the truth of the matter. Kent knows the truth of the matter. You know the truth of the matter. We all know that we know the truth of the matter. Now, Brady, lets get together and complete this exercise so many in the rest of the world will also come to a knowledge of the truth regarding Kent Hovind, his long criminal history, and what Kent, and you, really think about “we the people”. Typical of Kent and Brady, the promotional video gives no actual references to support their claim(s). So, I will with a little speculation offer two references that might explain their legal blundering regarding Form 4789. Won’t it be funny if Brady’s Blundering is as simple as is reflected in those 2 cases! Learn About Case Laws and Statutes that Protect Americans From Being Abused! necessarily the views of CSE INC., or its principals. My name is Brady Byrum, the forensic paralegal investigator in this DVD series. The purpose of this educational content is to inform Americans of the injustice done to the Creation Science Evangelism Church Ministry and Kent Hovind while also helping prepare people for possible misuse and abuse by evil men and women in positions of authority. This DVD series is intended to inform the People of America about the evil that goes on when no one is looking.